Day #3 of the #artjewelrychallenge and having so much fun deciding which jewelry to post and who to nominate next! I have been nominated for the #Artjewelrychallenge by my friend, fellow metalsmith and my previous studio mate Carli Holcomb. We share the love of organics and metal! 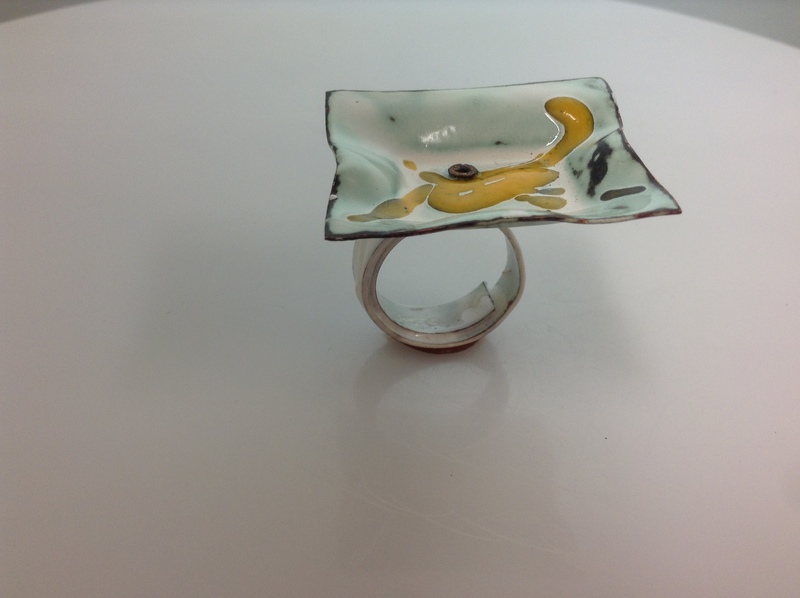 This challenge was started by Donna Greenberg in order to show the amazing things happing in the art jewelry world. I will share an image of my work a day for five days, and nominate a new artist each day. Today I would like to nominate Chris Irick, an amazing metalsmith artist that has amazing craft and curiosity. She also trail blazes her own trail when it comes to technique and I love that out of the box thinking! She shares her knowledge so unselfishly and I was fortunate enough to learn first hand from her about the hydraulic press and I am now in LOVE with the hydraulic press! The jewelry I’m posting today is a new design that merges my love for enamel, glass and metal with the hydraulic press in forming the metal. Thanks Chris and I hope to see you in Boston at SNAG!